In October we focused on improving the experience for many constituents: reviewers, applicants, and administrators. 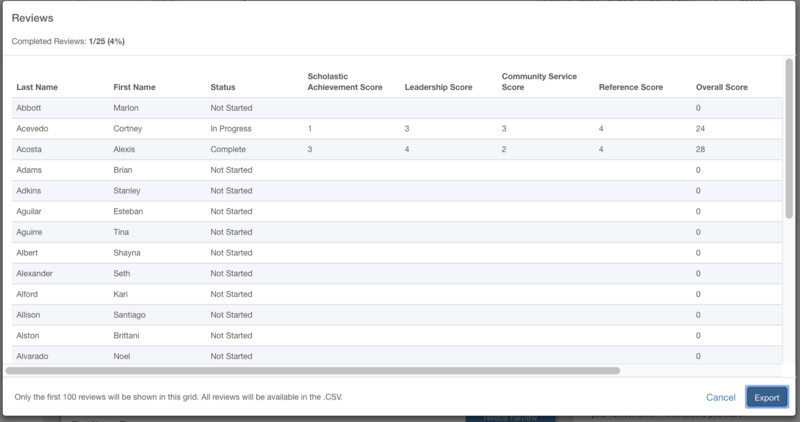 Reviewers can now view a grid of all assigned applications and the review form entries they have completed. This grid can be filtered based on status of the review. Reviewers can also export this grid for further analysis, comparison, and ranking - all contributing to a more fair and accurate review process. Note: this feature is optional and needs to be turned on by an administrator. Listing pages in the submission portal were redesigned to remove applicant confusion around draft items. The status column was replaced with a draft indicator, so that it would not conflict with other columns that may indicate status, such as in a letter of recommendation request. The role builder was redesigned for administrators to easily add and edit form permissions. Any form permissions that are different from the default are clearly highlighted in green, and unsaved changes are highlighted in yellow. Additionally, there is new messaging to indicate when the workspace is close to reaching the limit of 30 forms with custom permissions across all roles. We introduced a new portal gating feature for customers with extremely high application volume. Available only for enterprise customers, this feature guarantees a stable application experience even with thousands of concurrent applicants. Re-allowed required fields to be hidden from reviewers in review portals. Consent text and required acceptance now displays properly for portals with SSO enabled. Default login text now displays properly for newly configured portals. Letter generator properly saves new templates.